Multiple Media - Maximum Impact! wgohwugo.com - our website, featuring area news, sports, weather and community information, live webcasting, and information about our stations. Click the photo to open and print for great advertising ideas! Whatever your marketing objectives, we have a solution for you! Radio reaches 92% of the public in any given week, and Go Radio has been Carter County's number one station for 58 years. 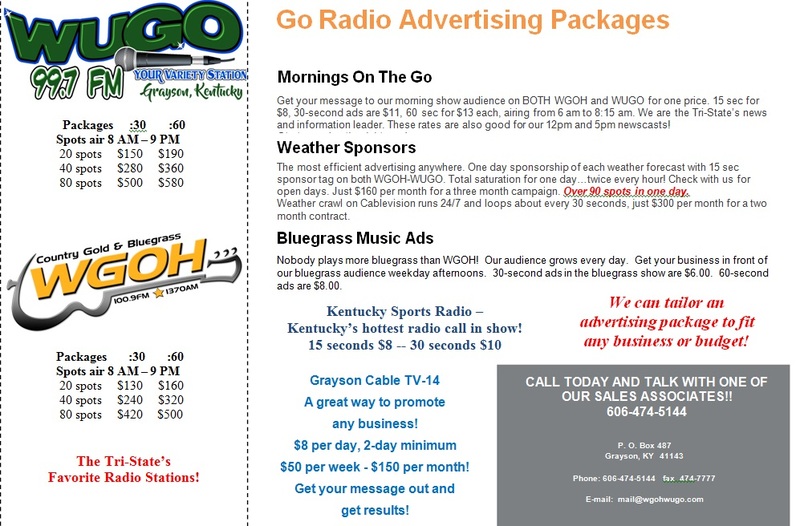 Our basic rates for 30 second ads are as low as $8 on WUGO-FM and $6 on WGOH-AM-FM. We have numerous packages that include News segments, Sports networks, and mixed packages to take advantage of all media, radio, internet and cable TV. Grayson Cable TV is seen in over 2300 households, and TV-14 is efficient advertising with rates at $50.00 per week or $150 per month for full page ads, 24 hours per day, 7 days per week. Your business can purchase a banner display ad on wgohwugo.com with millions of page views for as low as $50 per month. Our website here averages over 10,000 unique visitors monthly. Email us or call us at (606) 474-5144 and an advertising representative can custom design a campaign for you. Carter Co Broadcasting, WGOH WUGO radio and TV 14, do not and will not discriminate, in any way on the basis of race or ethnicity with respect to advertising practices. No advertiser may us this station to discriminate on the basis of race or ethnicity and any contract entered into with an advertiser with the intent to discriminate shall be null and void.